The Potomac River Jazz Club is a non-profit society formed in 1971 to preserve and promote the playing and appreciation of traditional dixieland jazz, a unique American art form. This is the music that originated among black musicians in New Orleans around the turn of the century and migrated up the Mississippi River. It encompasses jazz in this classic form as well as its derivations in Chicago and San Francisco styles plus blues and ragtime music. Our musical heroes are Louis Armstrong, Jelly Roll Morton, Bessie Smith, Bix Beiderbecke, Sidney Bechet, Jack Teagarden, James P. Johnson, Fats Waller, the West Coast revival stars including Lu Watters, Turk Murphy and Bob Scobey and all the other early jazz luminaries. 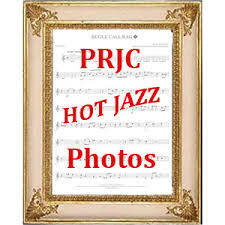 The PRJC helped to found and is an active member of the American Federation of Jazz Societies. It is a founding member of the Cultural Alliance of Greater Washington. Our membership of more than 700 is concentrated in the Washington-Baltimore metropolitan area, but we have members across the U.S. and in Canada. We invite all jazz lovers to join us in the fun, friendships and satisfaction this music brings. What Does the Potomac River Jazz Club Do? We present frequent concert-dances that feature jazz bands, both local and out of town, for our members and the general public. We publish a highly acclaimed 12-page monthly newsletter, Tailgate Ramblings, to publicize musical events in the local area and report other matters of interest to our members. We sponsor a widely admired and highly successful youth learning program which brings talented young musicians between the ages of 15 and 26 under the guidance of an experienced jazz educator to provide them with a grounding in the fundamentals of jazz, as well as specialized training in the traditional New Orleans styles and their offshoots. They rehearse and perform as the Capital Focus Jazz Band. Check its web page at http://www.prjc.org/cfjb/ for more information. We are affiliated with more than 30 local area jazz bands and assist them in publicizing their performances, help them find gigs, and hire them for our club-sponsored events. To receive a PDF sample of "Tailgate Ramblings" send an e-mail to PRJC with "Sample Newsletter" as the subject line and include your name in the text.